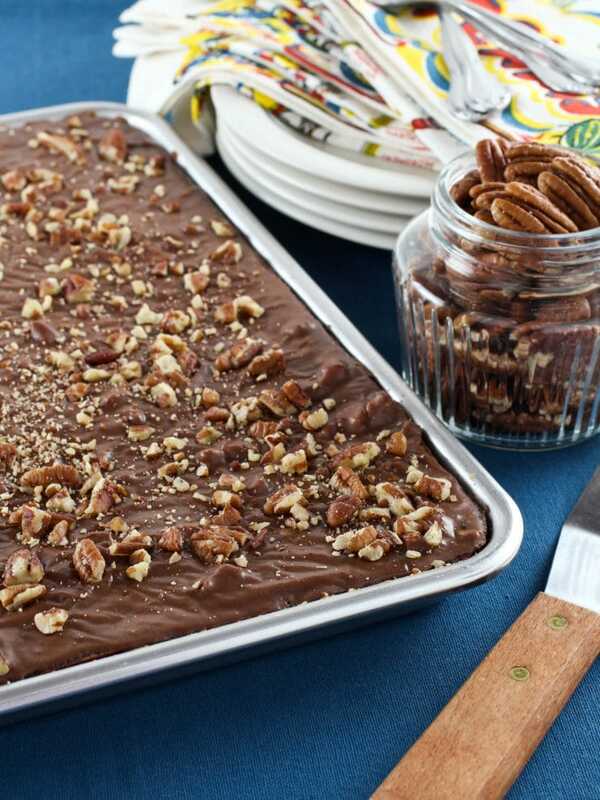 Texas Sheet Cake – Rich, Moist Chocolate Sheet Cake Topped with Chocolate Frosting and Toasted Pecans. Tried-and-True, Quintessential Texas Dessert Recipe. One of my most treasured possessions is a cookbook that was created by the PTA of my elementary school. The cookbook was a fundraiser for a computer lab, something that was almost unheard in the early 1980’s, and contains recipes for everything from appetizers to desserts. The recipes were submitted by staff and students, and it contains mostly easy to make, kid-friendly recipes for tried-and-true family favorites. My father and mother were members of the PTA, and along with the board they saw that the students needed to become computer literate to compete in the future. The problem was a lack of funds. While the school district agreed that computers were the wave of the future, there was little budget for a computer lab that could accommodate an entire classroom of students at one time. Never ones to back down in the face of adversity, the PTA decided to raise the funds needed though a series of fund raisers. We had a school carnival where we sold tickets to play games, enter a maze, and participate in a raffle for prizes donated by local businesses. We also had an auction presided over by my father, and we sold cookbooks. I remember that putting the book together was quite a chore. All the recipes were submitted by students and teachers, and there was even art work created by the students for each section. It took the help of a lot of people to transcribe the recipes considering our school only had two computers. The volunteers would type up each handwritten recipe, format each page, and finally, once it was all printed, bind each book. The book clocked in at a hefty 282 pages! It was a labor of love, and when it was all said and done our school had 14 new state-of-the-art (for the time) Apple IIe computers! As I said before, many of the recipes are for kid-friendly fare, as the kids were asked to submit their favorite treats, but some of the recipes are a little more mature and challenging. There are even some exotic recipes such as gulab jamon (fried dough balls soaked in cardamom syrup from India) and Singapore Style Fried Chicken (fried chicken marinated in five spice powder and Shaoxing wine). 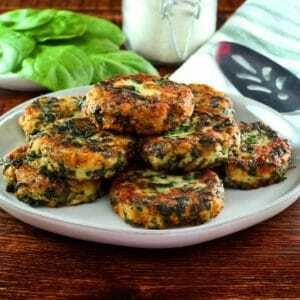 I have used the book as a resource in the past since the recipes are very reliable. 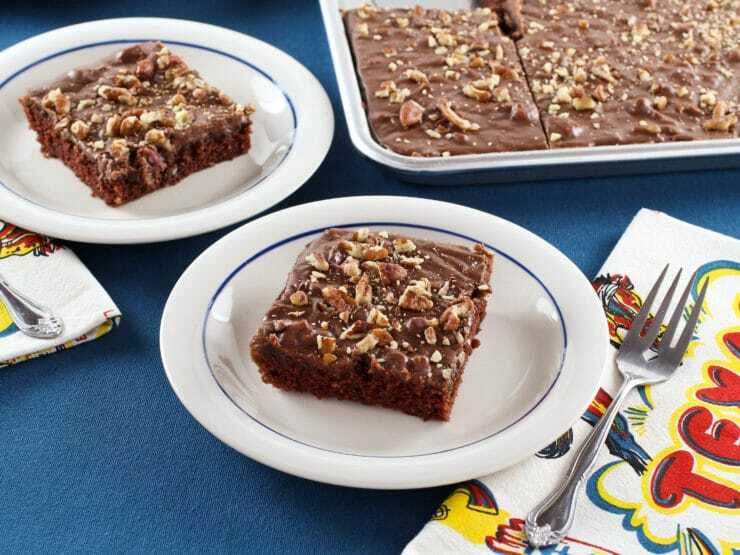 A Texas made cookbook isn’t complete without the quintessential Texas dessert – Texas Sheet Cake. The origins of this cake are a little murky, as are the claims from Texans far and wide that it is our invention. The cake became popular in the South in the 1950’s just after German Sweet Cake or German’s Chocolate Cake became popular. 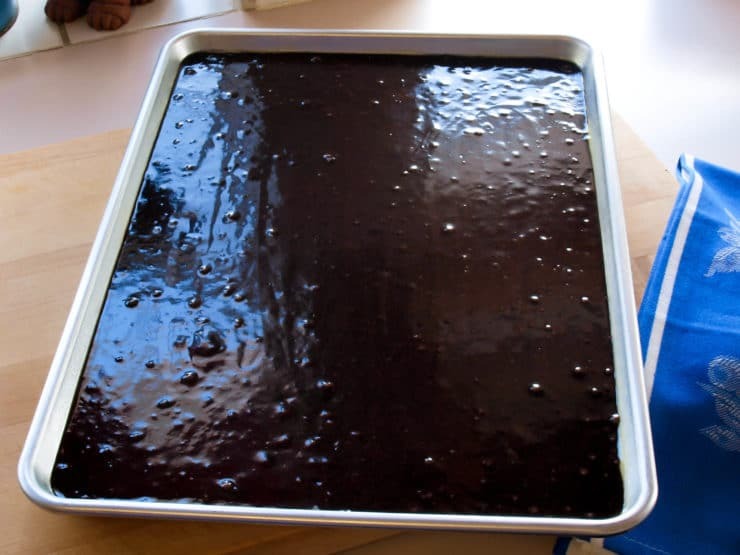 The Texas Sheet Cake has a similar flavor, but is much, much easier to prepare, making it immensely popular. What I know for certain is this cake is one of my absolute favorites. It is a staple of holidays, birthday parties, and pot lucks from Houston to El Paso, and it is easy to understand why. The cake is baked and served in a jelly-roll pan and it is incredibly moist. The fudge like frosting is poured onto the cake while it is piping hot, so it soaks into the top of the cake just a little, and you can add some toasted pecans if you like (and I do like). The cake is simple to prepare, it actually tastes best baked a day ahead, and it requires no fancy decorating skills. If you want the best possible Texas Sheet Cake I recommend you use full fat sour cream, whole milk, and regular, not Dutch-processed, cocoa powder. Some recipes I have tried substitute ½ cup buttermilk for the sour cream, but I prefer the sour cream version as I find the cake has a better texture. 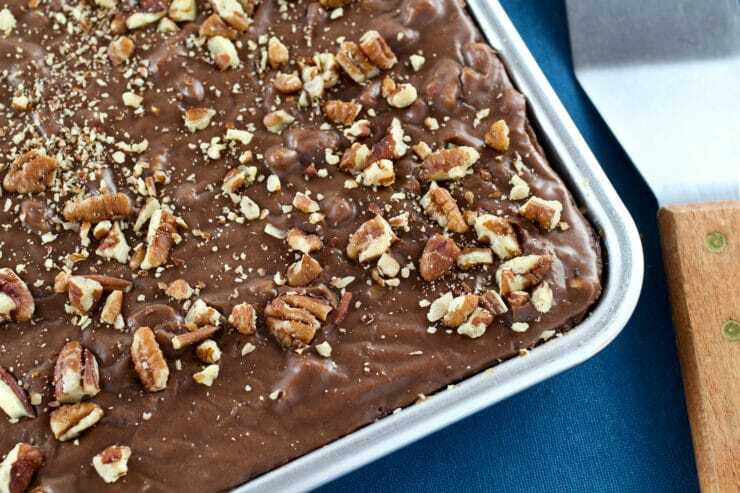 If you don’t like nuts, by all means do not add them, but a Texas Sheet Cake is not the same without toasted pecans. If this cake is being baked for the holidays add a teaspoon of cinnamon in with the dry ingredients for some spicy warmth. 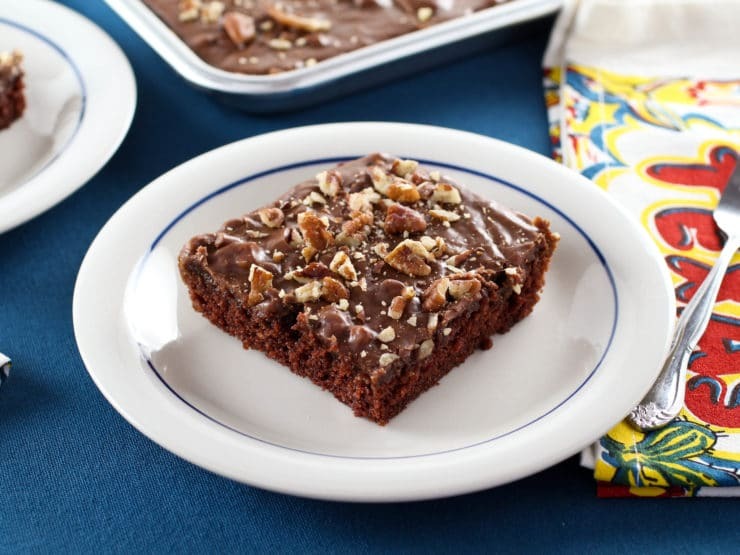 Rich, moist chocolate sheet cake topped with chocolate frosting and toasted pecans. Tried-and-true, quintessential Texas dessert recipe. Heat the oven to 350°F and spray a 13-inch x 18-inch x 1-inch jelly roll pan with non-stick cooking spray. 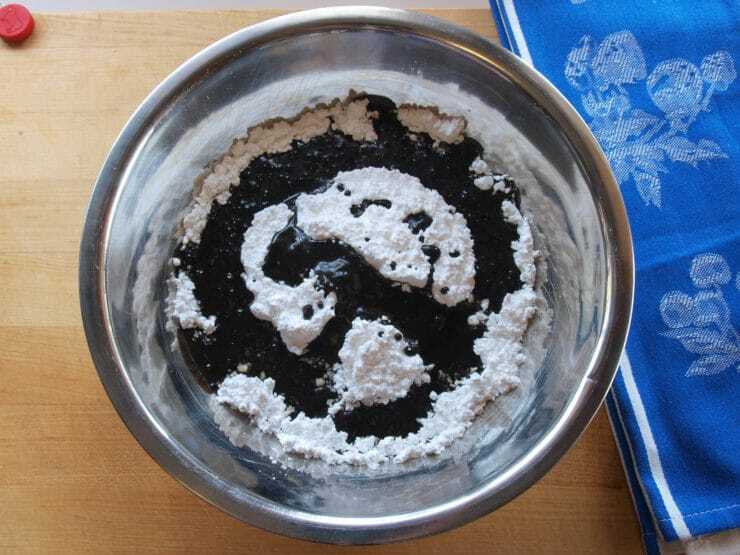 In a large bowl combine the flour, sugar, baking soda, and salt. Whisk the mixture until well combined and set aside. 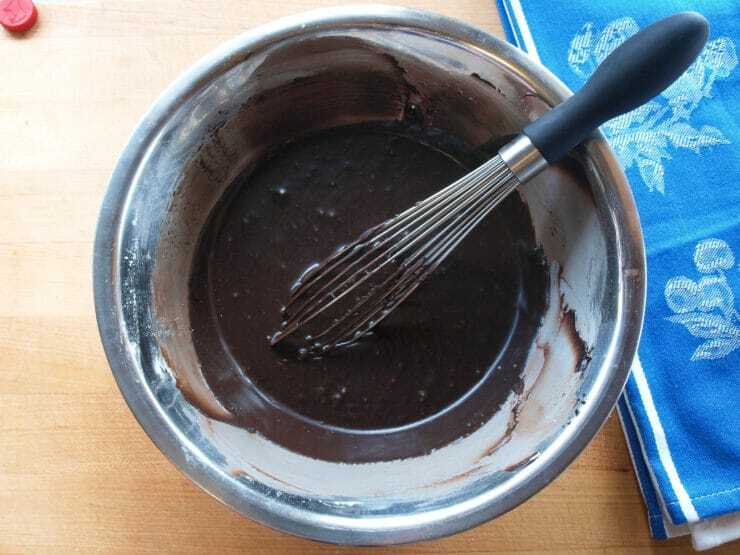 In a medium sauce pan over medium heat add 1 cup of butter, water, and 1/3 cup cocoa powder. Bring the mixture to a boil, stirring often, then remove from the heat and add to the flour mixture. Mix to combine then add the sour cream, eggs, and vanilla and mix thoroughly. Spread the mixture into the prepared pan and bake for 20-22 minutes, or until the cake springs back when gently pressed in the center and the edges of the cake are coming away from the sides of the pan. While the cake is baking prepare the frosting. 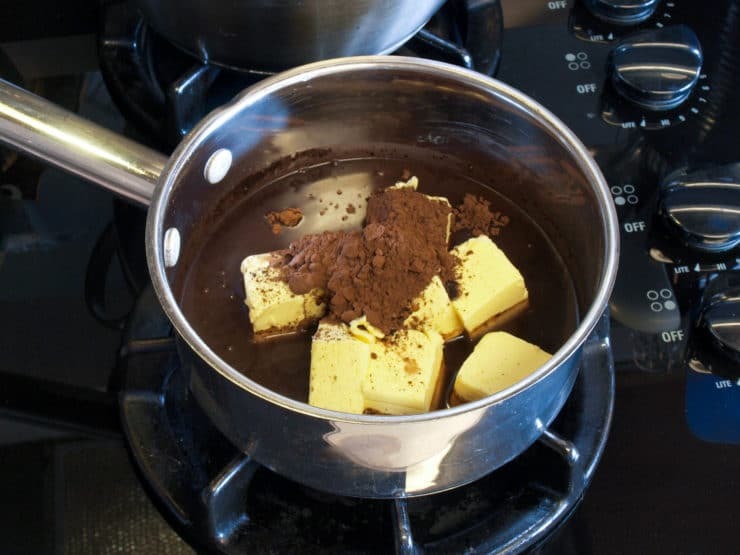 In a medium bowl combine ½ cup melted butter, milk, and ¼ cup cocoa powder and mix until smooth. Add the powdered sugar to a large bowl and add the butter mixture and vanilla. Whisk until no lumps remain. Cover with plastic wrap or a damp tea towel until the cake has finished baking. Pour the frosting on the cake as soon as it comes out of the oven. Spread the frosting to the edges of the cake. Then immediately sprinkle the toasted pecans over frosting. Let the cake cool completely to room temperature before serving. The hot chocolate mix (butter, water, cocoa powder) should be fine to add to the flour mix. It will have cooled down somewhat before you need to add the eggs etc. I doubt that it would scramble the eggs if that is what you are concerned about. Looks like a lovely recipe, going to give it a try. This cake is absolutely delicious!! Super moist and rich and not complicated to make! I will be making it again very soon!! 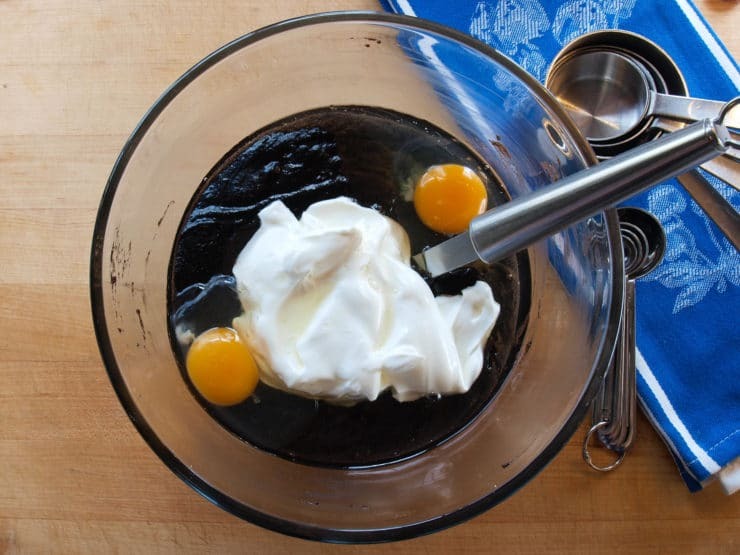 Are you using a mixer at all to mix the eggs and sour cream? I always use a little instant coffee in the cake as well as frosting. It makes the chocolate flavor ‘pop’ and is a favorite among my friends and family. Can you make the Texas sheet cake a day before serving? Or best on the day? I used to make this a lot in the 80’s and take it to work for my co-workers. It was quite a success. I got kinda emotional over this recipe. My Mom use to make this cake all the time and it has been requested for family functions, but she passed away in 2013 and I never got her recipe. Thanks to you, I can now make this for Christmas. Thank You for sharing this. And I’m from Texas and it’s Always been a staple in the South. We used to have this cake for dessert at school. I’m sooo happy to “re-find” the recipe! I made this twice actually, for family get togethers, ALWAYS the hit of the party. Everybody loves it!…. *absolutely, cinnamon! This is exactly what I’ve been looking for!! Thank you. How far in advance can I make this cake (without putting frosting on top) and still have it come out yummy? I need to make several for our Homeless Family Soup Kitchen and I don’t think I can get them all done the day before. 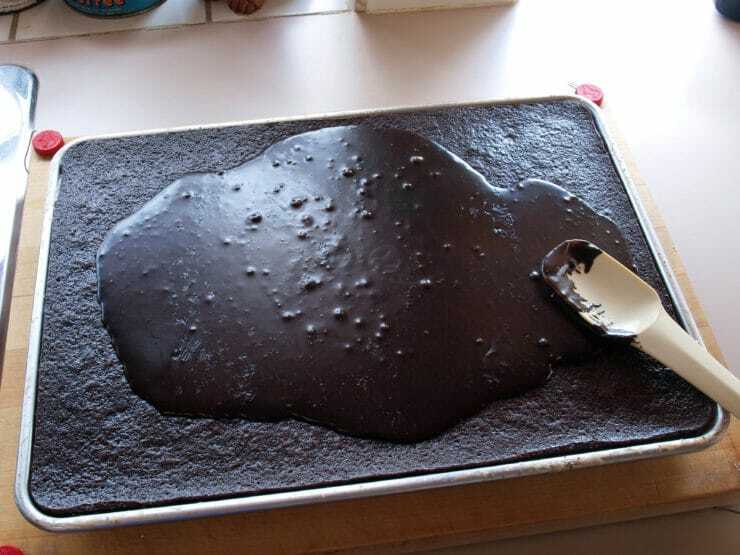 I would never make a Texas Sheet Cake and then not ice/frost it immediately! You will have a real mess I am afraid. It’s best to frost while the cake is warm and the frosting is too. And you should have no problem in baking 2 or even 3 in one day. This could be done in a morning or afternoon! Should it be 1 teaspoon of vanilla the icing? The recipe calls for 1 tablespoon. Wesley, it’s in the first step – 350 degrees F.
I was just going to say that the defining characteristic that makes it a “Texas” sheet cake is the addition of 1/2 tsp of cinnamon. Otherwise it is really just a yummy chocolate cake with fudge icing. But when you add that lhint of cinnamon, this cake is transformed into something truly amazing with a little Tex-Mex kick! Will this work in a 13 x 20 sheet pan ? As it is quite a shallow cake, can you make it gluten free? Has anyone tried baking “spongey sweet” things with coconut, tapioca, millet, chickpea flour etc? (I am using chickpea flour to make savoury pancakes and indian breads at the moment…..such a diverse flour!). I am Just starting to try out gluten free recipes …..3 weeks gluten free at the moment….and would love to find a recipe for a nice dark moist chocolate sponge/brownie, perhaps fat wise with coconut and ghee instead of butter. Trying to avoid commercial wheat free flour blends as they tend to be rice and potato, instead I want to work with flours that it is likely our bodies will have been used to for hundreds of years. ….close to the idea of paleo….so I can quite imagine coconut and chickpeas being ground to make flour by our ancestors, but think almonds would be less likely…..as it would have taken them ages! My 50 year old receive says to sift flour. Once with salt and once with sugar. 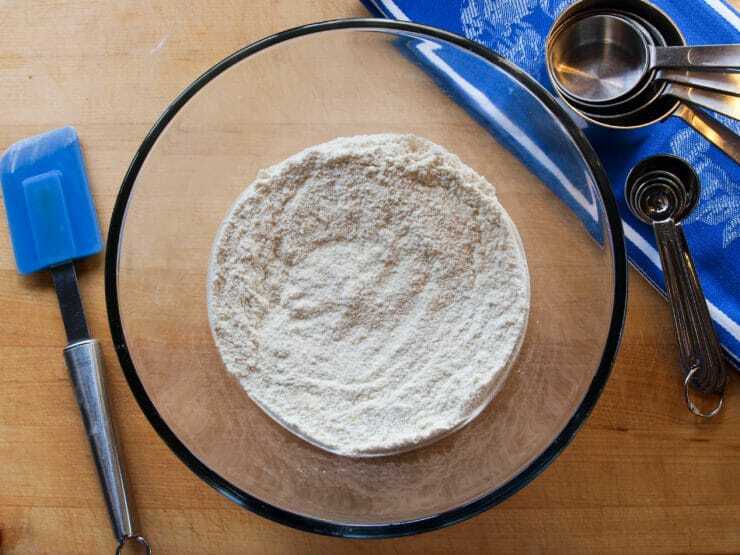 Scantily measure flour before sifting. Does anyone cool hot cocoa mixture before adding buttermilk, etc ? You don’t have to. The flour should cool it off enough so your eggs don’t turn into scrambled eggs. If you think it’s still to hot then wait a bit won’t hurt but you do want the sr.crm to melt into the mix. Sifting is a choice now a days. It’s a dense cake so I personally don’t sift for it. Good luck. I have made this recipe so many times I’ve lost count! Always a huge hit with family and work colleagues. I made this yesterday for my husband’s bday. I followed the recipe exactly, except substituted lactose free butter, sour cream, and milk. It was the most delicious and perfectly textured cake I have made in a long time. Thanks! I’m from western Pennsylvania and Texas sheet cake was always a staple at our family functions. It was ALWAYS made with cinnamon, and I’m thinking walnuts were used instead of pecans. This is just awesome! Don’t mind counting the calories 🙂 Thanks. I had made this cake many year ago but had lost the recipe. I am so happy to see your recipe. I live at high altitude. Do I need to adjust the recipe? If so, how? Thank you. Allow it to cool before adding. Cocoa powder is not the same as hot chocolate mix. Every time I make this cake it is commented on with good review. Instead of pecans I have done the Andie’s mints pieces which they love. 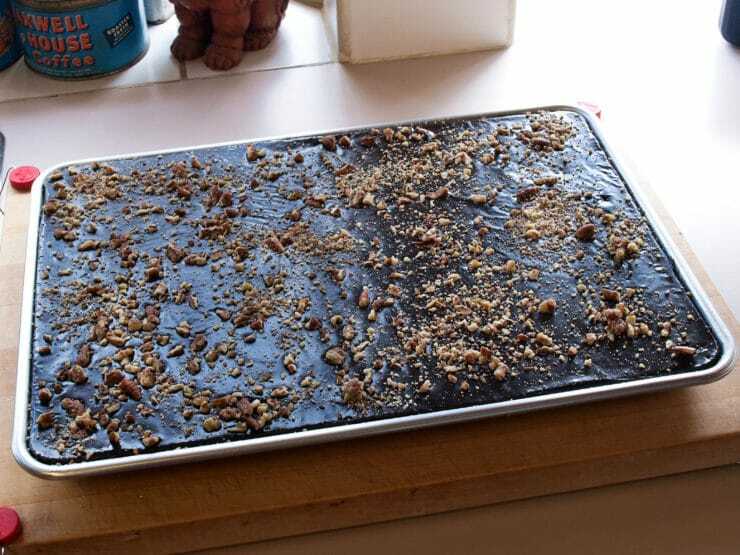 Now at a get-together I hold a sheet of paper down the middle and sprinkle half mint and half pecan. Great cake recipe, and if your from Texas it needs to be in your cook book we love it here. I make it every all the time .My mother is from Texas i am a Texan at heart i was born in Pennsylvania but its in my cook book . I made this!! So YUMMY!! This cake is so good. I have made it twice now. The first time I followed the direction exactly and it was wonderful. The 2nd cake, I used brown sugar in the cake recipe instead of the regular sugar and that was really good too! 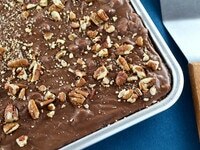 I can’t wait to make this scrumptious Texas Sheet Cake very soon!! Just printed this out from the newsletter! Can’t wait to make it for our next Oneg or Taste of the Town event for our Synagogue, especially since I am a resident of Central Texas y’all!!! Is there anything else I could use instead of the sour cream? In our family we have used sour cream, buttermilk or mayo. All are great! Have been living in Texas since 1978. This is the first time I have heard of this cake. Looks great. Yes, I think I do need this! Made mine last Wednesday, for National Chocolate Cake Day! My handed down recipe for this Texas sheet cake calls for the buttermilk, or vi egaf added tl milk jf nk buttermilk on hand. I m going to try the sour cream version on my next cake. I also mix the nuts in with the icing, instead of on top. ? Im sure delicious either way!! Very old recipe! Wow! This looks just like my Aunt Suzie’s chocolate cake (and she’s from Texas!) 😉 It’s my favorite…soo rich and delicious! sweet!! i’m definitely making this!! 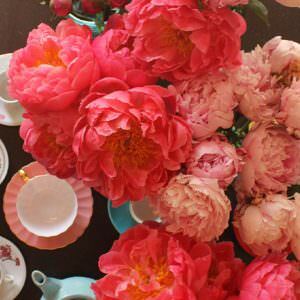 Delicious and easy- perfect combination! My gosh, this looks so good! 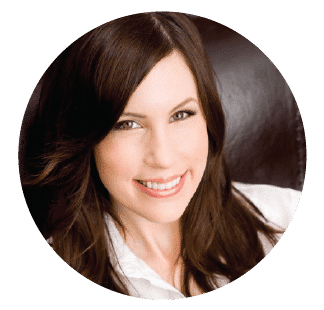 I’d make it in a flash as I ❤️ your recipes but doing the 21 day fix(so far so good). I’ll save this recipe. Between you and the #overtime cook and her #somethingsweet cookbook I have gotten out of control!!! I was just talking about that cake today at the office!